I love the rotisserie chickens from the grocery store. They are so delicious, enough so that I could just sit and eat it without any sides. 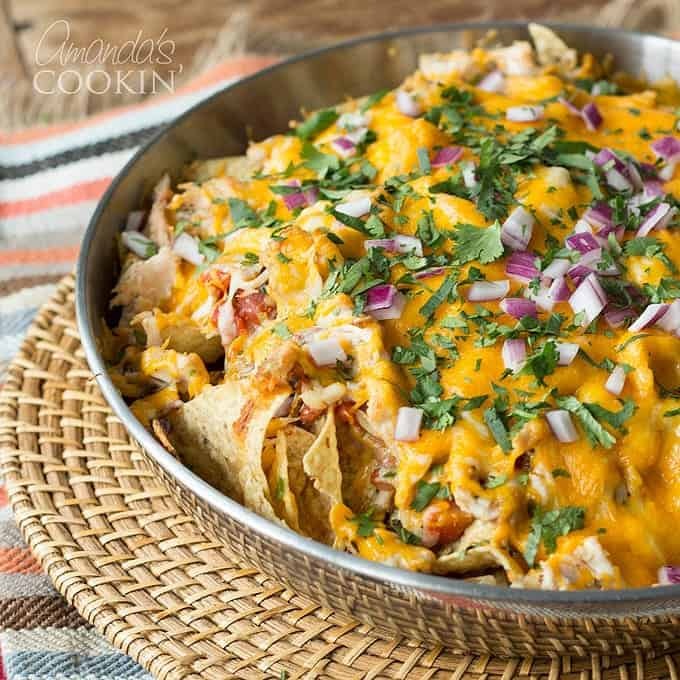 These rotisserie chicken nachos are the perfect appetizer for a party or watching the big game with friends. They are super easy, though there is a little bit of chopping involved. Give yourself about half an hour to throw this together. 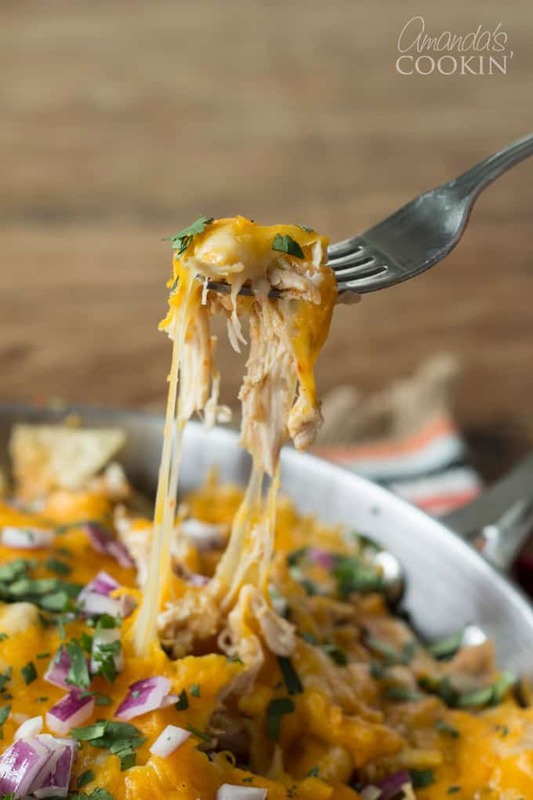 Oh the cheesy goodness…as a Wisconsinite we tend to use a lot of cheese, if you prefer you can alter the amount of cheese to your liking. Just know, it may look like an insane amount that you add on top but I promise you once it’s melted and evenly spreads over the nachos you won’t regret using the same measurements! I was inspired by this amazing recipe for Pulled Chicken Chilaquiles from A Family Feast. I had pinned it some time ago. While searching for dinner ideas this recipe caught my eye. I was looking for something quick, so I bought a bag of my favorite restaurant style chips. Her recipe makes them from corn tortillas fried in oil. I definitely want to try that someday when I have more time. My son is particularly infatuated with nachos. I’m sure he would live off of them if he could. In fact, he raved about the filet mignon nachos too. So it’s safe to say there won’t be any leftovers after making these bad boys. Be sure you have a big appetite if it’s going to be just you and one other, as these feed around 6-8 people! If you are feeding a smaller bunch or you’re wanting to serve these as an appetizer, feel free to cut the recipe in half. If you do that you can use a 9-inch skillet instead. You just can’t go wrong with these. Throw in some olives, sour cream, or even avocado. The options are endless when it comes to nachos. The first time I made these I used refried black beans and a couple types of cheese; sharp cheddar and pepper jack. I also made a quick guacamole by smashing an avocado adding in some chopped cilantro and red onion along with some garlic salt, although this is just an optional addition. 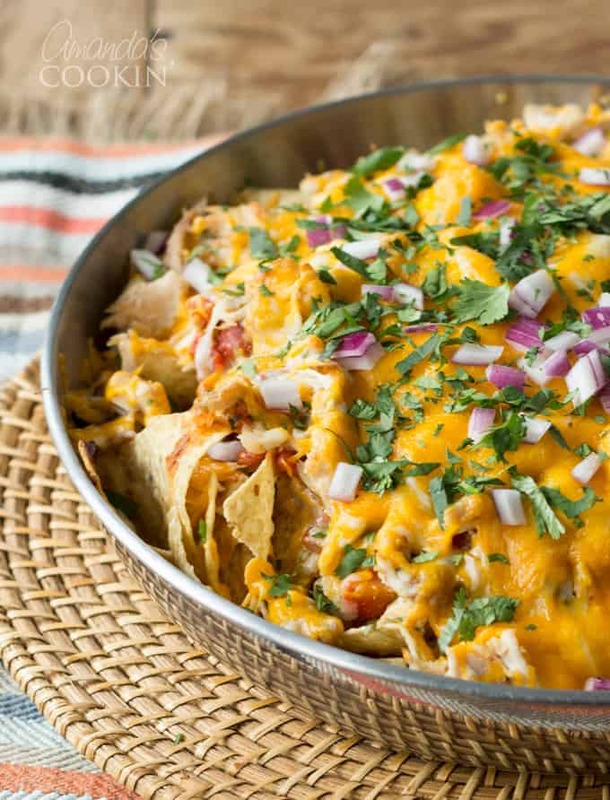 Enjoy your nachos and remember, the more cheese the better! These rotisserie chicken nachos are the perfect appetizer for a party or watching the big game with friends. Preheat oven to 450 F and fill a large oven proof skillet with tortilla chips. Prepare salsa by sauteing Jalapeno and diced onion in olive oil for several minutes, until tender. Add garlic and saute another minute or two. Add remaining salsa ingredients and bring to a boil. Simmer over low heat, uncovered, for 5-10 minutes. Shred the chicken and warm in the microwave. Drop dollops of refried beans over the top of the tortilla chips in the pan. Layer warm salsa over the refried beans. Layer chicken over the salsa. 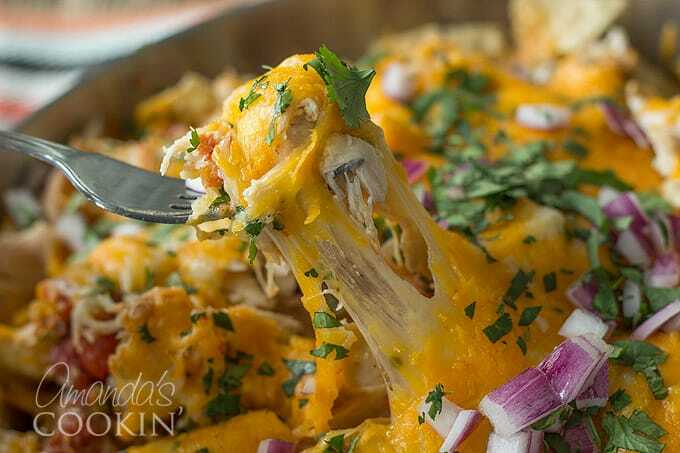 Layer both cheeses over the chicken and bake in preheated oven for 5-7 minutes, or until cheese is melted. Remove from oven and sprinkle with cilantro and red onion for garnish. Serve immediately. HELPFUL TIP: To serve these nachos, scoop out individual portions with a spatula. Serve with sour cream and guacamole as accompaniments. This post was originally published on this blog on June 16, 2015. My family does not like retried beans. Can it be omitted? Amanda…this dish is crazy beautiful! I make rotisserie chicken nachos too, but they don’t look this picture perfect LOL. Really nice photography, gal! I just saw this delicious recipe on Pinterest. I have to say I will be trying this. And as a fellow Wisconsinite, I think the amount of cheese is just right! Hi, Nicole! Too funny, gotta love all that cheese! :) I hope you enjoy! These look great and super easy! 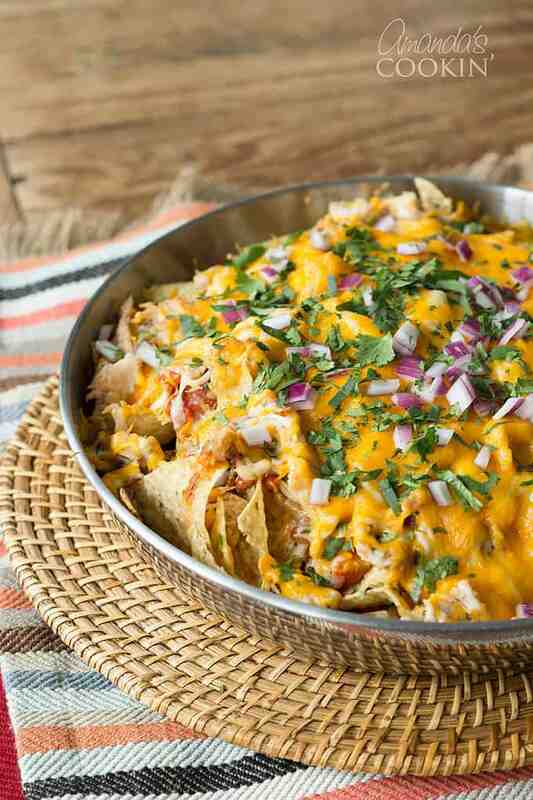 My kids love nachos so I’ll be making these soon. Thanks Martha, yours looks awesome!